Well, it is just about 3.30am whilst typing this. After what was meant to be 40 winks on the sofa I woke up at 1.00am quite awake and went into the studio to work some more on the cyborg daemon. Finished the reworked skin texture with some nice boils, now just the bony ridge around the skull plate to rework and some modifications in the jaw area.I want to be baking this tomorrow night ideally. After that some sanding, fitting of the tongue and detailing that and then some photos. Time to go to bed methinks. More work done on the Cyborg Daemon today, the back was resculpted along with the textures and additional veins added. I like veins. This project has taken way longer than anticipated and after a quick start I hit a few problems with it and it was sidelined due to artistic block. I started Thuggorre as I had no other projects on the go at the time to help and then hit problems with him to. But we need to get this guy out there so hopefully by wednesday you will be seeing so pictures of a nice, well evil, daemon right here. The Thuggorre project has gone from concept art to finished product and has been followed by many people in the forums. It was certainly an interesting project, sharing the whole process as a typical work in progress thread, if a little time costly taking pictures, uploading, posting across the different forums and so on. 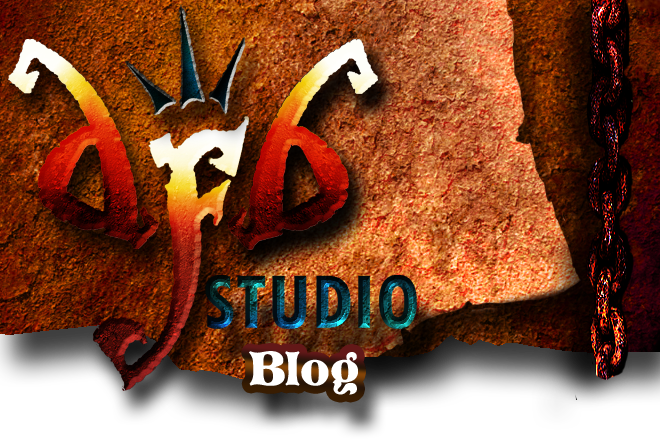 Most other companies will give a sneek peek at some concept art, the finished green and then the final painted product. With Thuggorre I wanted to share the whole thing, it was just down to my own excitement and the fact I know I would be interested in knowing all the small details involved with product development by the major mini companies out there like Games Workshop, Forgeworld, Enigma, Rackham and so on. Being one artist in a studio doing all this on a much smaller scale I knew it would not hold the allure of watching the masters at work, but I hope the WIP has been relatively enjoyable nontheless. I would sell my soul to poke my nose into the goings on of some of the major art studios across the world!! The artist who painted Thuggorre for me has now uploaded the final photos to his Cool Mini Or Not gallery and can be viewed below, please give him your vote!!! Grey Matter Figures will be attending the Telford IPMS Scale Model World show on the 13th and 14th November and Thuggorre will be there available for you to take a look at or purchase. Grey Matter Figures will be licensed to sell selected pieces of work I do and this is the first to be made available. You can of course purchase direct from me at www.dfbstudio.webs.com where I have the webstore set up. At the workbench today, when I have finished typing this I will be straight onto the cyborg daemon commission, I have to remake the horns on the back of him and do a little bit of retexturing where I hacked half of the back out to start again. I will take the opportunity to work in some more intricate veins as well. When this is done it will be very close to completition and submission of final photos to the client. I must say having the demon on the bench for a long time has really made the super sculpey firm clay a joy to work with and I may do this with other project, time allowing. That or use the fridge to chill it and firm it up in a slightly different manner. 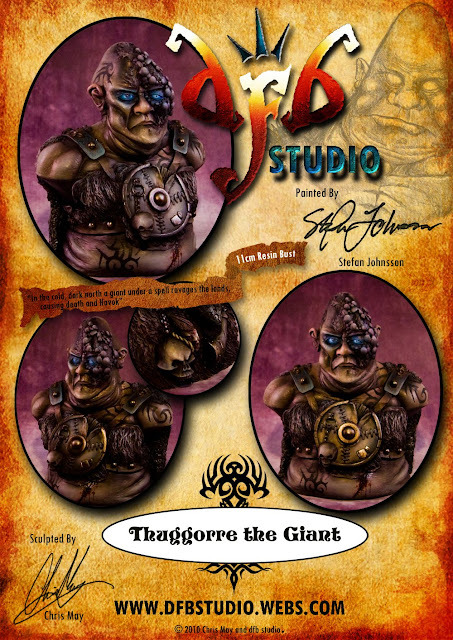 Stefan has finished painting Thuggorre and the today I put together a little product flyer for him which can be seen below showing off the paintjob and a modified logo. I just want to say a big thank you to Stefan for doing this for me, I am beyond pleased with the work done on him and the photos. Thanks Stefan!! Nurgle Test warrior is complete and can be seen over on various forums in my WIP threads - wip thread most of yesterday was spent getting nowhere fast, although I did manage to work on the cyber daemon for an hour or two and must say he is very much improved. The day just seemed to disappear. A bit of a hair tearing day today trying to figure out why Photoshop can't do image maps and how to do rollover effects and can I even upload it to a free website anyway??!! Wasted alot of time and got nowhere despite having all the graphics work done. I am just wondering whether to ditch the website builder and just do the whole thing in a proper app and upload the whole site directly. As much as I like the idea of designing a website the actual complexity (well to me at any rate) kind of kills any fun there is to be had in the design process. On the sculpting front I spent about an hour on the Cyborg Daemon cutting away his back and putting the reshaped muscle back in, some adjustments to the head and neck and I am having second thoughts on the spine. I need this one to be perfect as it is for a client and will definately turn out to be the best sculpt I have done to date, the skin textures are especially nice, lots of little veins, warts, boils and open flesh wounds. I need to rework the horns in places as well, some of them popped out. The Nurgle Knight test model is finished and his buddies are in progress, I need to find out whether I need to do lots more to make up a regiment to the correct size etc. I am not too clued up regarding Warhammer rules. They will be for sale when I have had my fun at any rate and I think I have taken away something from this painting process. I have achieved a smooth surface finish , the shading and highlighting are not too bad and I achieved some nice skanky metal as well. Definately a neat if unremarkable job on the test model. A set of signed Natalya Melnik (Alezi_Z on CMON) DVD's should be sent down to me soon from a friend who attended GENCON 2010, so hopefully my skills will pick up after absorbing that material and putting it into practice. The Giant Just Crashed Through My Door !!! It appears that Royal Mail messed up and the package containing the casts I should have had Saturday was not delivered nor a card left for to collect it with. Nonetheless I have now picked it up and Thuggorre is ready to be shipped. Please order at the link below if you would like one. I have found a better webstore to use and am in the process of setting things up, updates will be posted on that when done. I am really happy with the graphics work I have done on the logo and packaging and when my current sculpting commission is finished I will be moving on to to put some time into setting up the website into something bearable to look at.